Too many business people are too business-like. As a result what they say and what they write doesn’t really engage. Stories are central to humans. We are told stories from birth. Mum and Dad tell us stories to get us to sleep; they read us bed-time stories at night. At school, everything we learn involves stories. A child’s mind is programmed from birth for stories. So is it any wonder we love stories? Yet for some reason, business people often believe that they need to set-aside stories and instead become formal and straight to the point. Engagement plummets. 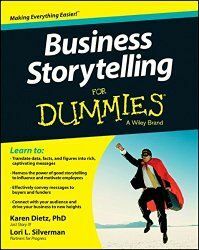 As this book shows, stories can be used in a wide variety of settings within business. It explains how to translate data and facts into stories. You will discover how to use stories to motivate your team. Plus you will find out how to get more sales using stories. This book will transform your business communications. It also leads by example, with plenty of stories within it. Can an infographic be about infographics?